The Regimental Museum was first established in the Depot Keep at the Barracks in Highroad Well, Halifax, in 1921. It was later moved to the former Band practice room. Its primary purpose was to educate recruits in the traditions and history of the Regiment. During the period of National Service (1948–1959) it was managed by the Depot Education Officer. In 1961, after the Depot closed, the Museum was relocated to Bankfield Museum, one of the Halifax (later Calderdale Borough) museums. The building then became the Regimental Headquarters when the Depot closed. Bankfield Museum was formerly the home of Colonel Edward Akroyd, who paid for and recruited the 4th Yorkshire West Riding (Halifax) Rifle Volunteers, absorbing the 7th battalion formed in 1859. In 1883 the title of the Volunteers changed to the First Volunteer Battalion (Duke of Wellington’s) West Riding Regiment. A further change took place in 1908 when it became the 4th Battalion (DWR). In 1938 it changed name and role once more to the 58th Anti-Tank Regiment (DWR) Royal Artillery. Following several more post WW2 mergers of various battalions in ‘the Dukes’ it eventually became part of the 3rd Battalion Yorkshire Volunteers (Duke of Wellington’s). 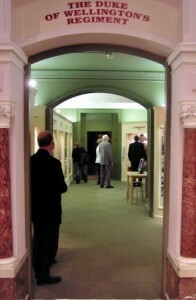 The Museum was refurbished in 1984-85 and reopened by the Colonel in Chief, The 8th Duke of Wellington in 1986. In 1991 the National Museums and Galleries Commission formally registered the Museum. 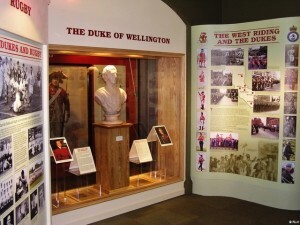 Further changes to the Museum displays were planned in 2003/4, The changes had a new style and and content to previous museum displays to tell the story of the Regiment “Through Soldiers Eyes”. The first phase of this refurbishment was achieved with the assistance of a Grant from the National Lottery Heritage Fund. It was opened by the Colonel of the Regiment, Major General Sir Evelyn Webb-Carter KVCO OBE and the Mayor of Calderdale on the 22nd of October 2005. The Collection illustrates the history of the Regiment from the raising of the 33rd Foot in 1702 and the 76th Foot in 1787 to the present day. The Museum has undergone a recent redesign to tell the story of the Regiment ‘through the eyes’ of the soldiers who served in it. There is a strong emphasis on the unique traditions of the Regiment and its links with the West Riding of Yorkshire. Each period case focuses on two or three soldiers and tells their story in their own words through recordings and displays of their life in “The Dukes”. Other exhibits relate to the local Volunteer, Militia and Territorial Forces and there are displays of objects associated with the Iron Duke himself and the Regiment’s heritage; and as a name synonymous with Rugby in the British Army. click here: To see a related article published in the Halifax Courier on 6 February 2008. 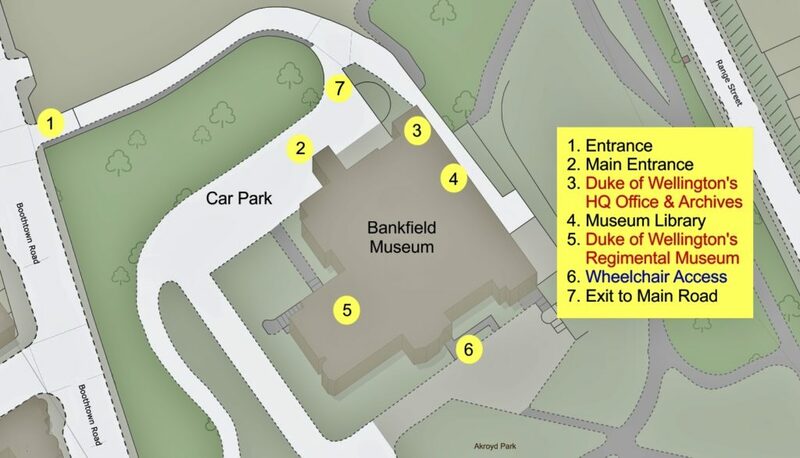 Bankfield Museum, Boothtown Road, Halifax, West Yorkshire, HX3 6HG. Open: Tuesday to Saturday and Bank Holiday Mondays 10AM – 4PM. Closed: Mondays, 25th December – 1st of January.